Katy Anderson has experienced more heartache than most know in a lifetime. Given to a man old enough to be her father, she has spent the past six years secluded from everyone except for her three young children. Her husband’s untimely death brings relief that … finally … she and her children are free. When Sheriff Mitch Logan arrives at the Anderson homestead, he is moved by Katy’s sad circumstances and vows to right the wrongs done to her. Mitch has always shied away from marriage due to his dangerous profession, yet he quickly changes his mind when Katy comes into his life, and into his heart. She turned toward the kitchen, leaving Mitch to entertain her children while she went back to her sink full of dishes. A new, totally unexpected twinge poked at Katy’s belly when she thought of the sheriff, of how he’d come into their lives through tragedy and accepted her, and her children, without question, without judgment. Mitch Logan was a decent, honorable man. “Yes, Sheriff,” she called back, a light chuckle escaping her lips. The flutter came again and Katy pressed her hand against her stomach, wishing away the confusing emotions clouding her thoughts every time Mitch came near. 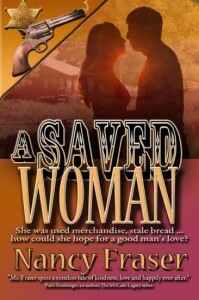 She was used merchandise, stale bread, and nothing good could come from her attraction to the handsome sheriff. She wouldn’t let it. A Saved Woman is available in digital format from Amazon or The Wild Rose Press.